Salk scientist provides theoretical framework for understanding biological complexity. Despite advances in neuroscience, the brain is still very much a black box—no one even knows how many different types of neurons exist. Now, a scientist from the Salk Institute has used a mathematical framework to better understand how different cell types divide work among themselves. The theory, which is described in the journal Neuron on June 7, 2017, could help reveal how cell types achieve greater efficiency and reliability or how disease results when the division of labor is not as effective. In the 1950s, information theory was developed to study how to send messages in the most cost-effective manner while minimizing errors. This theory is also relevant for how neurons in the brain communicate with each other. 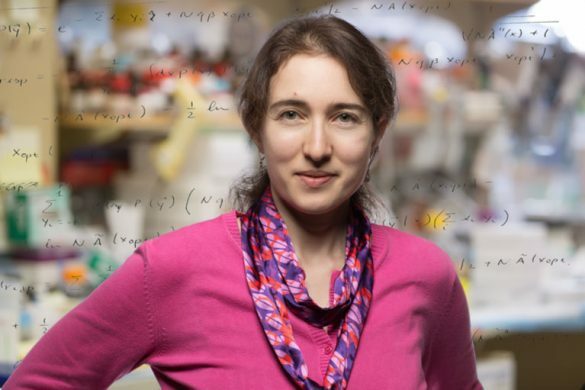 Sharpee, who uses information theory to discern fundamental laws governing biological complexity, says it can help predict how many different cell types to expect in a system and how these cell types should work together. Sharpee and colleagues published this idea in 2015 in Proceedings of the National Academy of Sciences, explaining why neurons in the salamander retina that are sensitive to dimming lights split into two sub-types, whereas comparable neurons sensitive to increases in light do not. It turns out that neurons sensitive to light dimming are more reliable than neurons sensitive to light increases. The increased reliability of dark-sensitive neurons means they can represent signals of different strengths separately whereas neurons sensitive to light increases have to work together, in effect averaging their responses. In this analogy, less reliable neurons are like trainees, whose answers need to be averaged because they might all be slightly off. More reliable neurons are the proficient workers, who can be given different tasks because each one’s accuracy can be trusted. In the new paper, Sharpee further describes how these arguments can be generalized to help us understand how different proteins (such as ion channels that help us produce signals in the brain in the first place) divide the input ranges to achieve greater overall efficiency for the organism. Based on information theory, the arguments can also be applied outside of neuroscience. “The theory that we tested in the retina can be relevant for understanding the complexity of many other systems, because if you have noisy input-output elements it’s better to average their output. And if the elements are slightly more capable they can be more specific and divide up the dynamic range,” adds Sharpee. She is working with a number of groups to test and broaden the range of applications, such as inflammation, mood disorders, metabolism and cancer. Salk and UC San Diego scientists conducted vast microglia survey, revealing links to neurodegenerative diseases and psychiatric illnesses. Scientists have, for the first time, characterized the molecular markers that make the brain’s front lines of immune defense–cells called microglia–unique. In the process, they discovered further evidence that microglia may play roles in a variety of neurodegenerative and psychiatric illnesses, including Alzheimer’s, Parkinson’s and Huntington’s diseases as well as schizophrenia, autism and depression. 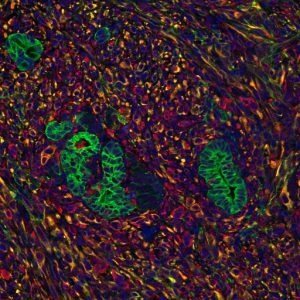 Salk scientists find that targeting the interaction between a pancreatic tumor and its microenvironment could weaken cancer. Tumor cells stained with a marker for cancer (green) appear near stromal cells (red). Credit: Salk Institute. Just as an invasive weed might need nutrient-rich soil and water to grow, many cancers rely on the right surroundings in the body to thrive. A tumor’s microenvironment—the nearby tissues, immune cells, blood vessels and extracellular matrix—has long been known to play a role in the tumor’s growth. Now, Salk scientists have pinned down how signals from this microenvironment encourage pancreatic tumors to grow by altering their metabolism. Blocking the pathways involved, they reported in Proceedings of the National Academy of Sciences the week of January 16, 2017, can slow the growth of a pancreatic cancer. Pancreatic cancer has the worst five-year survival rate of any major cancer and is expected to be the second leading cause of cancer deaths by the year 2030. It’s notoriously resistant to both chemotherapies and emerging immunotherapies, Evans says, emphasizing the importance of new treatment paradigms. A marker for cancer (green) appears near stomal cells (red) in tumor cells. Credit: Salk Institute. Previous research has shown that the signals coming from surrounding stromal cells include both supportive signals—which help pancreatic tumors grow—and suppressive signals—which try to fight the cancer. To understand specifically how pancreatic cancer cells take advantage of any supportive signals, Evans’s team first had to come up with a method to mimic how pancreatic cancer cells grow so closely integrated with the stroma. “We worked out a culture system so that we could grow human pancreatic cells in a three-dimensional system in both the presence and absense of stromal signals,” says first author Mara Sherman, a former Salk postdoctoral research fellow now at Oregon Health & Science University. 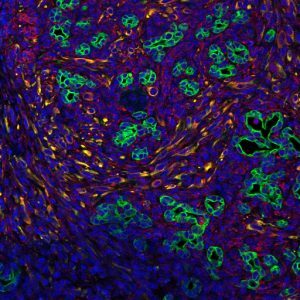 When stromal signaling molecules—isolated from patients or generated in the lab—were present, the metabolism of pancreatic cancer cells changed, the researchers found. Not only were levels of metabolic compounds different, but the expression of certain genes involved in metabolism was turned up, and the epigenome of the cells—molecular markers on DNA that change gene expression on a broader scale—was altered. “The tumor is essentially hacking into that stromal microenvironment and grabbing what it needs to up its metabolism,” says Michael Downes, a Salk senior scientist involved in the research. 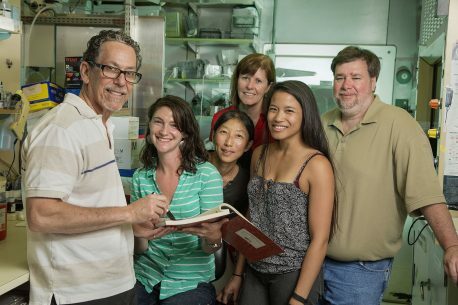 From left: Ronald Evans, Mara Sherman, Ruth Yu, Ann Atkins, Tiffany Tseng and Michael Downes. Credit: Salk Institute. To try to block this “hacking” of the microenvironment by the cancer cells, the team turned to a drug called JQ1, which is known to block the epigenome changes that they’d observed. Indeed, when JQ1 was added to the 3D culture system, it reversed the genetic changes to the pancreatic cancer cells that the stromal signals had caused. Moreover, when mice with pancreatic tumors were treated with JQ1, tumor growth was slowed. More work is needed to reveal whether JQ1, or similar compounds, can shrink or slow the growth of pancreatic tumors in humans and what other pathways in the cancer cells may be responding to the tumor microenvironment, but the findings pave the way for that research. Other researchers on the study were Ruth T. Yu, Tiffany W. Tseng, Sihao Liu, Morgan Truitt, Nanhai He, Ning Ding, Annette Atkins, and Mathias Leblanc of the Salk Institute; Cristovao Sousa of Harvard Medical School; Christopher Liddle of the University of Sydney; Eric Collisson of the University of California, San Francisco; John Asara of Beth Israel Deaconess Medical Center; and Alec Kimmelman of the Dana-Farmer Cancer Institute. The work and the researchers involved were supported by grants from the National Institutes of Health, the Glenn Foundation for Medical Research, the Leona M. and Harry B. Helmsley Charitable Trust, and Ipsen/Biomeasure. Using postmortem human brains and human embryonic stem cell models of brain development, Salk Institute researchers discover a new mechanism to generate DNA variation in human neurons. Here, human embryonic cell- derived neurons stained for a neurons specific marker (Tuj1, green, DNA show in red) show remarkable diversity. No image credit. Our brains contain a surprising diversity of DNA. Even though we are taught that every cell in our body has the same DNA, in fact most cells in the brain have changes to their DNA that make each neuron a little different. Now researchers at the Salk Institute and their collaborators have shown that one source of this variation—called long interspersed nuclear elements or L1s—are present in 44 to 63 percent of healthy neurons and can not only insert DNA but also remove it. Previously, these L1s were known to be small bits of DNA called “jumping genes” that copy and paste themselves throughout the genome, but the researchers found that they also cause large deletions of entire genes. What’s more, such variations can influence the expression of genes that are crucial for the developing brain. The findings, published September 12, 2016 in the journal Nature Neuroscience, may help explain what makes us each unique—why even identical twins can be so different from one other, for example—and how jumping genes can go awry and cause disease. In 2005, Gage’s team discovered L1s as a mechanism of genome diversity in the brain. However, it was not until it became possible to sequence the entire genome of a single cell that scientists could get a handle on the amount and nature of these variations. Using single-cell sequencing detailed in a 2013 Science paper, Gage’s group showed that large chunks of DNA were inserted—or deleted—into the genomes of the cells. But even in that study the mechanisms responsible for causing insertions and deletions were unclear, making it difficult to decipher whether specific regions of the genome were more or less likely to be altered, as well as whether jumping genes were related to the deletions. In the new study, Gage, co-first authors Jennifer Erwin and Apuã Paquola, and collaborators developed a method to better capture the L1-associated variants in healthy neurons for sequencing and created a computational algorithm to distinguish the variations with greater accuracy than before. Using stem cells that are coaxed to differentiate into neurons in a dish, the team found that L1s are prone to DNA breaks. That’s because a specific enzyme that chews through L1 spots in the genome is particularly active during differentiation. People inherit some L1s from their parents, and the enzyme appears to cut near these spots, the group found. “The surprising part was that we thought all L1s could do was insert into new places. But the fact that they’re causing deletions means that they’re affecting the genome in a more significant way,” says Erwin, a staff scientist in Gage’s group. Gage believes that diversity can be good for the brain—after all, about half of our brain cells have large chunks of missing or inserted DNA caused by L1s alone—but that too much of it can cause disease. Recent evidence has shown that neurons derived from individuals with schizophrenia or the rare autism-associated disorder Rett syndrome harbor more than normal amounts of L1 variations in their genomes. In the new study, the team examined a schizophrenia-associated gene called DLG2, in which introducing L1 variations can change the gene’s expression and subsequent maturation of neurons. The group plans to explore the role of L1 variations in other genes and their effects on brain activity and disease. Other authors on the study are Tatjana Singer, Iryna Gallina, Carolina Quayle, Tracy Bedrosian, Cheyenne Butcher, Joseph Herdy and Anindita Sarkar of Salk; Mark Novotny and Roger Lasken of the J. Craig Venter Institute; Francisco Alves of the University of São Paulo in Brazil; and Alysson Muotri of the University of California, San Diego. The research was supported by George E. Hewitt Foundation for Medical Research, the California Institute for Regenerative Medicine, the National Institutes of Health (MH095741, MH088485), the G. Harold & Leila Y. Mathers Foundation, the Engman Foundation, the Leona M. and Harry B. Helmsley Charitable Trust, the Paul G. Allen Family Foundation, the Glenn Center for Aging Research at the Salk Institute, and JPB Foundation. Partnership of government, academics and industry will develop new ways of studying and screening drugs for major psychiatric illnesses. The Johns Hopkins University School of Medicine and the Salk Institute for Biological Studies will co-lead a $15.4 million effort to develop new systems for quickly screening libraries of drugs for potential effectiveness against schizophrenia and bipolar disorder, the National Institute of Mental Health (NIMH) has announced. The consortium, which includes four academic or nonprofit institutions and two industry partners, will be led by Hongjun Song, PhD, of Johns Hopkins and Rusty Gage, PhD, of Salk. Bipolar disorder affects more than 5 million Americans, and treatments often help only the depressive swings or the opposing manic swings, not both. And though schizophrenia is a devastating disease that affects about 3 million Americans and many more worldwide, scientists still know very little about its underlying causes—which cells in the brain are affected and how—and existing treatments target symptoms only. With the recent advance of induced pluripotent stem cell (iPSC) technology, researchers are able to use donated cells, such as skin cells, from a patient and convert them into any other cell type, such as neurons. Generating human neurons in a dish that are genetically similar to patients offers researchers a potent tool for studying these diseases and developing much-needed new therapies. The teams will use iPSCs generated from more than 50 patients with schizophrenia or bipolar disorder so that a wide range of genetic differences is taken into account. 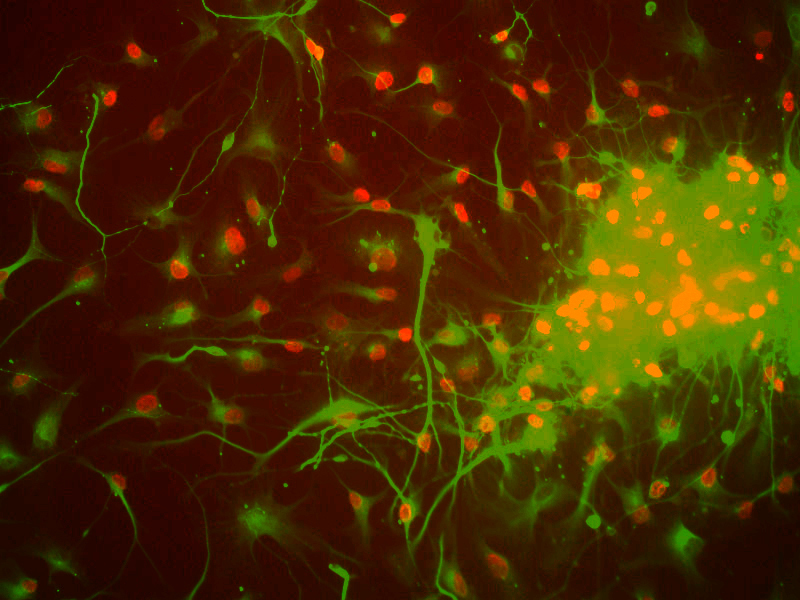 By coaxing iPSCs to become four different types of brain cells, the teams will be able to see which types are most affected by specific genetic differences and when those effects may occur during development. First the researchers must figure out, at the cellular level, what features characterize a given illness in a given brain cell type. To do that, they will assess the cells’ shapes, connections, energy use, division and other properties. They will then develop a way of measuring those characteristics that works on a large scale, such as recording the activity of cells under hundreds of different conditions simultaneously. Once a reliable, scalable and reproducible test system has been developed, the industry partners will have the opportunity to use it to identify or develop drugs that might combat mental illness. “This exciting new research has great potential to expedite drug discovery by using human cells from individuals who suffer from these devastating illnesses. Starting with a deeper understanding of each disorder should enable the biopharmaceutical industry to design drug discovery strategies that are focused on molecular pathology,” says Husseini K. Manji, M.D., F.R.C.P.C., global therapeutic area head of neuroscience for Janssen Research & Development. The researchers also expect to develop a large body of data that will shed light on the molecular and genetic differences between bipolar disorder and schizophrenia. And, since other mental health disorders share some of the genetic variations found in schizophrenia and bipolar disorder, the data will likely inform the study of many illnesses. When you reach for that pan of brownies, a ball-shaped brain structure called the striatum is critical for controlling your movement toward the reward. A healthy striatum also helps you stop yourself when you’ve had enough. But when the striatum doesn’t function properly, it can lead to disorders such as Parkinson’s disease, obsessive-compulsive disorder or addiction. In fact, the exact functions of the striatum are by no means resolved, and it’s also a mystery how the structure can coordinate many diverse functions. Now, a new study published August 25, 2016 by Salk Institute researchers and their colleagues in the journal Neuron, delves into the anatomy and function of the striatum by employing cutting-edge strategies to comprehensively map one of the brain’s lesser-known forms of organization. 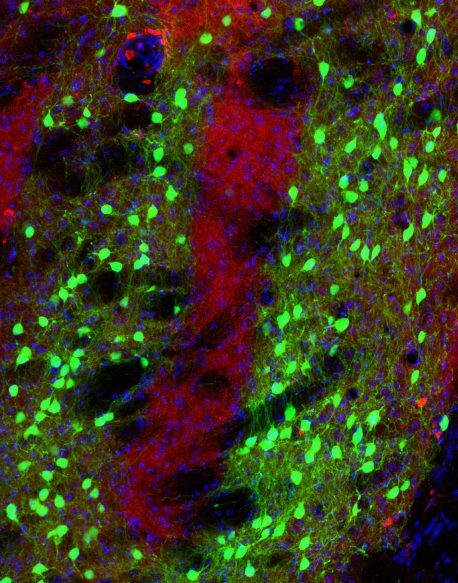 “The most exciting result from this research is that we now have a new avenue to study long-standing questions about how the striatum controls movement in both healthy and diseased brains,” says the study’s senior investigator Xin Jin, an assistant professor in the Molecular Neurobiology Laboratory at Salk. Forty years ago, researchers discovered a unique way that the striatum is organized. It is dotted with patch neurons, which under the microscope look like tiny islands of cells. The ocean surrounding them is made up of neurons scientists collectively refer to as “matrix” cells. Over the course of four decades, scientists hypothesized about the role of patch and matrix neurons in neurodegenerative diseases. 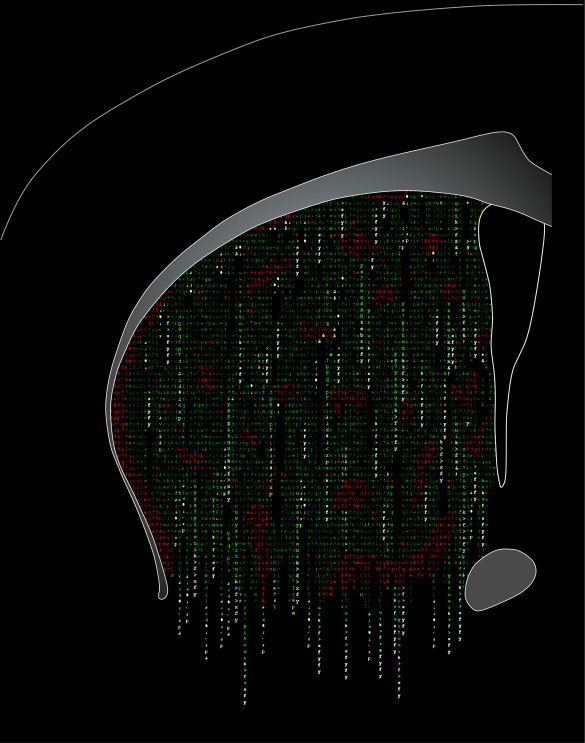 One idea was that patch cells were fed by the brain’s higher thought centers, suggesting they could play a role in cognition, whereas the matrix cells seemed to play a role in sensing and movement. In contrast, the new study dispels that idea, showing that both types of information are sent to the patch and matrix neurons, though patch cells tend to receive slightly more information from the brain’s emotion centers (these are included in the higher thought centers). But those results could help explain why, in the brains of patients with neurological disorders like Huntington’s disease (a progressive neurodegenerative disease affecting movement and other functions), patch cells and matrix cells are both affected, Jin says. Jin, together with the paper’s first authors Jared Smith, Jason Klug and Danica Ross, drew upon several technologies to uncover these new findings. The first was genetic engineering to selectively and precisely target the patch versus matrix neurons; traditionally, researchers used staining methods that were not as exact. Secondly, new neural tracing methods, including one generated by collaborator Edward Callaway and his group at Salk, allowed Jin’s team to chart the entire brain’s input to the patch and matrix cells and the output of each of the cell types as well. A third major approach, from the field of electrophysiology, enabled the scientists to confirm the connections they had mapped and to understand their strength. Patch and matrix neurons are not the only way that neuroscientists understand the striatum. The striatum also contains cells that take two opposing routes—the direct and indirect pathways—that are thought to provide the gas and brakes on movement, so to speak. Those indirect and direct pathways are also crucial for certain behaviors, such as the formation of new habits. Interestingly, both patch and matrix groups contain both indirect and direct pathway cells. That makes the story of the striatum more complicated, Jin says, but in future studies his team can study the intersection of these two types of organization in the context of how the striatum controls actions in health and disease. Other authors on the study are Jason Klug, Danica Ross, Christopher Howard, Nick Hollon, Vivian Ko, Hilary Hoffman and Edward Callaway of the Salk Institute; and Charles Gerfen of the National Institute of Mental Health in Bethesda, Maryland. The research was supported by grants from the National Institutes of Health, the Dana Foundation, the Ellison Medical Foundation, and the Whitehall Foundation. LA JOLLA—Boosting levels of a specific protein in the brain alleviates hallmark features of Alzheimer’s disease in a mouse model of the disorder, according to new research published online August 25, 2016 in Scientific Reports. The protein, called neuregulin-1, has many forms and functions across the brain and is already a potential target for brain disorders such as Parkinson’s disease, amyotrophic lateral sclerosis and schizophrenia. Previously, researchers have shown that treating cells with neuregulin-1, for example, dampens levels of amyloid precursor protein, a molecule that generates amyloid beta, which aggregate and form plaques in the brains of Alzheimer’s patients. Other studies suggest that neuregulin-1 could protect neurons from damage caused by blockage of blood flow. In the new study, Lee’s team tested this idea in a mouse model of Alzheimer’s disease by raising the levels of one of two forms of neuregulin-1 in the hippocampus, an area of the brain responsible for learning and memory. Both forms of the protein seemed to improve performance on a test of spatial memory in the models. What’s more, the levels of cellular markers of disease—including the levels of amyloid beta and plaques—were noticeably lower in mice with more neuregulin-1 compared to controls. A neuregulin-1 treatment is not available on the market, though it is being explored in clinical trials as a potential treatment for chronic heart failure and Parkinson’s disease. One advantage of neuregulin-1 as a potential drug is that it can cross the blood brain barrier, which means that it could be administered relatively noninvasively even though the efficiency is not clear. On the other hand, other research suggests too much of the protein impairs brain function. Working with chemists at Salk, Lee’s team has come up with a small molecule that can raise levels of existing neuregulin-1 (rather than administering it directly) and are testing it in cells. This alternative therapy could be a better way to prevent plaques from forming because small molecules more readily cross the blood brain barrier. The group is also interested in neuregulin-1 for its ties to schizophrenia. An alteration in the neuregulin-1 gene—a single change in one letter of the DNA code for the protein—has been found in families with schizophrenia and linked to late-onset Alzheimer’s disease with psychosis. The protein may be a way to understand the overlap between Alzheimer’s and other brain disorders, Lee says. An important caveat is that the new research was conducted in a single type of mouse model of Alzheimer’s. Lee’s group is testing neuregulin-1’s affects across other models. “There’s much more work ahead before neuregulin-1 could become a treatment, but we are excited about its potential, possibly in combination with other therapeutics for Alzheimer’s disease,” Lee says. Other authors on the study are Fred DeWinter, Catherine Farrokhi, Jonathan Cook and Xin Jin of Salk’s Clayton Foundation for Peptide Biology Laboratories; and Edward Rockenstein, Michael Mante, Anthony Adame and Eliezer Masliah of the University of California, San Diego. The research was supported by the National Institutes of Health, the Clayton Foundation, The Albert G. and Olive H. Schlink Foundation, the Gemcon Family Foundation and the Brown Foundation. The best natural chemists out there are not scientists—they’re plants. Plants have continued to evolve a rich palette of small natural chemicals and receptors since they began to inhabit land roughly 450 million years ago. Now, research by Salk Institute scientists published August 11, 2016 in the journal Cell reveals an unexpected role for a small, often overlooked molecule called phaseic acid, which has historically been cast as an inactive byproduct in plants—a metabolic dead end of sorts. 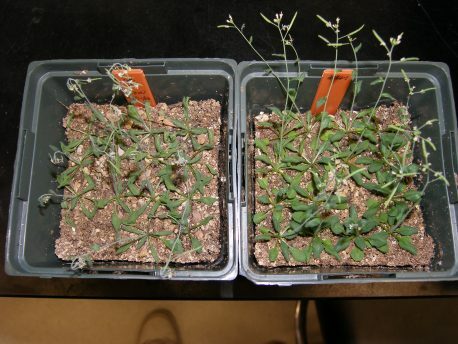 The new findings suggest that phaseic acid and its receptors probably co-evolved to become crucial for drought resistance and other survival traits and may inform the development of new, hardier crops that can weather natural disasters wrought by climate change. Phaseic acid has long lived in the shadows of its precursor—abscisic acid or ABA—which is a big deal in plant research. ABA is a plant hormone that’s present in all land plants and is key for responding to environmental stress and pathogens, in particular alerting the plant to drought conditions. ABA is also known for its connection to the good stuff in fruits and vegetables: carotenoids, such as beta-carotene and lycopene. Like all small natural molecules, ABA is produced through intricate metabolic pathways that transform simple carbon-based building blocks into structurally complex natural chemicals that collectively convey a substantial amount of information. Some plants are equipped with more than a handful of receptors for ABA, each of which carries out various functions in the plant. But paradoxically for its role as a master regulator, ABA itself seemed have equal preference for all its receptors, which would not be ideal for the fine-tuned control of plant function. In the new study, Noel’s team used a commonly studied plant called Arabidopsis thaliana and obtained varieties that lacked the enzyme that processes phaseic acid, in effect accumulating large amounts of phaseic acid. To the group’s surprise, the plants showed changes to the timing of seed germination and they survived without water for a longer time period. “This suggested to us that maybe we should be thinking of phaseic acid not as an inactive degradation product but actually as a molecule that had its own capacity to cause changes like other plant hormones,” says Noel. The scientists carried out a series of studies pointing to phaseic acid’s role as a plant hormone, showing for example that the addition of phaseic acid to normal seedlings triggered changes to the expression of numerous specific genes, especially genes coding for metabolic enzymes, that were overlapping but also distinct from those activated by ABA. In addition, using a high-resolution imaging technique called x-ray crystallography, the group showed that phaseic acid bound to ABA’s receptors, solidifying evidence that ABA’s receptors can sense more than just ABA. The new study suggests more broadly that there could be more hidden complexity to how organisms make use of small chemicals to bring about a variety of different responses. Evolution may well have repurposed other so-called end products of metabolism, Noel says. The study’s first author, Jing-Ke Weng, formerly a postdoctoral researcher in Noel’s lab, has set up an independent research group within Massachusetts Institute of Technology’s Whitehead Institute for Biomedical Research and Department of Biology that will continue to explore plant chemicals with previously unappreciated roles. “We hope to discover and understand the complexity of the hormones’, their metabolites and their collective interplay with receptors in various plants,” says Weng. This research was supported by the National Science Foundation, the Pioneer Foundation, the Pew Charitable Trusts, the Searle Scholars Program and the Howard Hughes Medical Institute. Other authors on the study are Mingli Ye of the Salk Institute and Bin Li of the University of California, San Diego School of Medicine. Salk researchers and collaborators have achieved critical insight into the size of neural connections, putting the memory capacity of the brain far higher than common estimates. The new work also answers a longstanding question as to how the brain is so energy efficient and could help engineers build computers that are incredibly powerful but also conserve energy. Our memories and thoughts are the result of patterns of electrical and chemical activity in the brain. A key part of the activity happens when branches of neurons, much like electrical wire, interact at certain junctions, known as synapses. An output ‘wire’ (an axon) from one neuron connects to an input ‘wire’ (a dendrite) of a second neuron. Signals travel across the synapse as chemicals called neurotransmitters to tell the receiving neuron whether to convey an electrical signal to other neurons. Each neuron can have thousands of these synapses with thousands of other neurons. The findings also offer a valuable explanation for the brain’s surprising efficiency. The waking adult brain generates only about 20 watts of continuous power—as much as a very dim light bulb. The Salk discovery could help computer scientists build ultraprecise, but energy-efficient, computers, particularly ones that employ “deep learning” and artificial neural nets—techniques capable of sophisticated learning and analysis, such as speech, object recognition and translation. Mitochondria, the power generators in our cells, are essential for life. When they are under attack—from poisons, environmental stress or genetic mutations—cells wrench these power stations apart, strip out the damaged pieces and reassemble them into usable mitochondria. 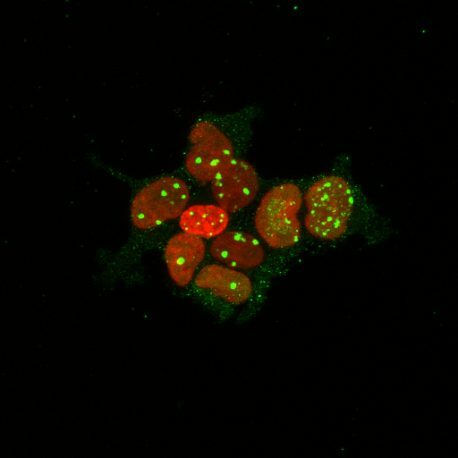 Now, scientists at the Salk Institute have uncovered an unexpected way in which cells trigger this critical response to threats, offering insight into disorders such as mitochondrial disease, cancer, diabetes and neurodegenerative disease—particularly Parkinson’s disease, which is linked to dysfunctional mitochondria. The work appears January 15, 2016 in Science. “Outside marauders come into these power stations of the cell—the mitochondria—and in response, the power stations break into smaller fragments,” says Reuben Shaw, senior author and Salk professor in the Molecular and Cell Biology Laboratory. In an average human cell, anywhere from 100 to 500 mitochondria churn out energy in the form of ATP molecules, which act like batteries to carry power to the rest of the cell. At any given time, one or two mitochondria fragment (fission) or reform (fusion) to cycle out any damaged parts. But when a poison—like cyanide or arsenic—or other dangers threaten the mitochondria, a mass fragmentation takes place. Researchers have known for years that mitochondria undergo this fragmentation when treated with drugs that affect the mitochondria, but the biochemical details of how the mitochondria damage is sensed and how that triggers the rapid fission response has not been clear until now. In the new work, the Salk team found that when cells are exposed to mitochondria damage, a central cellular fuel gauge, the enzyme AMPK, sends an emergency alert to mitochondria instructing them to break apart into many tiny mitochondrial fragments. Interestingly, AMPK is activated by the widely used diabetes therapeutic metformin, as well as exercise and a restricted diet. The new findings suggest that some of the benefits from these therapies may result from their effects in promoting mitochondrial health. Prior research by Shaw’s group and others had uncovered AMPK’s role in helping to recycle damaged mitochondrial pieces as well as signaling to the cell to make new mitochondria. But this new role of rapidly triggering mitochondrial fragmentation “really places AMPK at the heart of mitochondria health and long-term well-being,” says Shaw, who is also holder of the William R. Brody Chair. To uncover exactly what happens in those first few minutes, the team used the gene editing technique CRISPR to delete AMPK in cells and showed that, even when poison or other threats are introduced to the mitochondria, they do not fragment without AMPK. This indicates that AMPK somehow directly acts on mitochondria to induce fragmentation. The group then looked at a way to chemically turn on AMPK without sending attacks to mitochondria. To their surprise, they found that activating AMPK alone was enough to cause the mitochondria to fragment, even without the damage. “I could not believe how black and white the results were. Just turning on AMPK by itself gives you as much fragmentation as a mitochondrial poison,” says Shaw. The team discovered why this was: when the cell’s power stations are disrupted, the amount of energy floating around a cell—ATP—is lowered. After just a few minutes, AMPK detects this reduction of energy in the cell and hurries to the mitochondria. Like a guard pulling a fire alarm, AMPK activates a receptor on the outside membrane of a mitochondrion to signal it to fragment. Drilling down further, the researchers found that AMPK actually acts on two areas of a mitochondrial receptor, called mitochondrial fission factor (MFF), to start the process. MFF calls over a protein, Drp1, that binds and wraps around the mitochondrion like a beaded noose to twist and break it apart. Watch mp4 video here . In the future, the team is interested in addressing what other consequences this signaling pathway has for specific cell types, according to Sébastien Herzig, the other first author of the paper and a Salk research associate. “We want to see what a defect in communication between the mitochondria and AMPK would do to different tissues, particularly ones very dependent on healthy mitochondria, such as brain, muscle and heart,” says Herzig. Other authors of the work were Kristina Hellberg and Nathan P. Young of the Salk Institute; Julien Courchet, Tommy L. Lewis Jr. and Franck Polleux of Columbia University; and Oliver C. Losón, Hsiuchen Chen and David C. Chan of the California Institute of Technology. The work was funded in part by the Howard Hughes Medical Institute, NIH and The Leona M. and Harry B. Helmsley Charitable Trust.